I’m hooked! Someone gave me a small bottle of white truffle oil as a gift a while back and I’ve found it an incredibly easy way to make a pizza or pasta dish a bit more out of the ordinary. 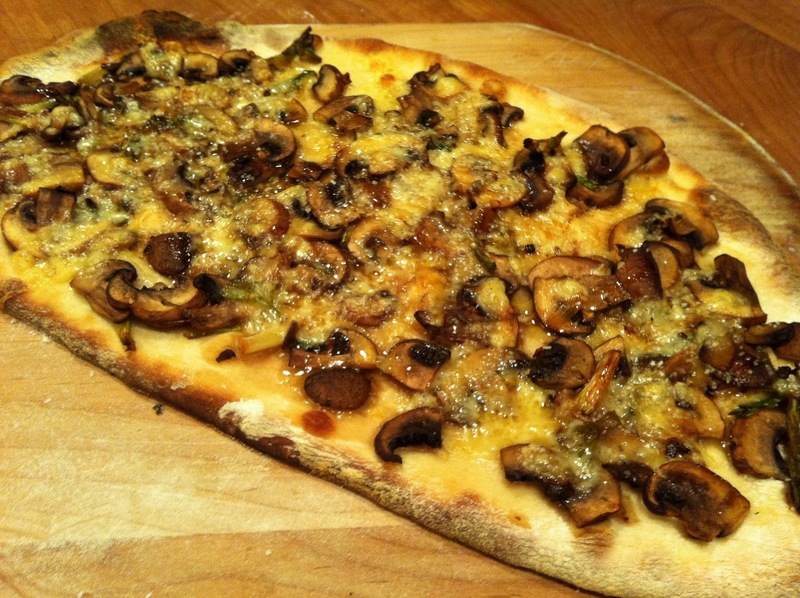 For my mushroom pizza I sliced and sautéed my mushrooms along with a few chopped scallions and some garlic until they were slightly soft. After lightly covering my rolled out pizza dough with some shredded pecorino I spread out the mushroom mixture and garnished with a little kosher salt before baking until crisp. Then, just before serving I sprinkled it all over with the truffle oil. Did the same sort of thing for an appetizer the other night but instead of spreading the mushroom mixture on a pizza dough I spooned it onto lots of baguette slices and served it at room temperature…very fancy…but not really.